My sister has caught the quilting bug! She recently visited for a few days and fell in love with a couple of quilts at my show, as well as taking a few of them home! Within a week, she called for advice on putting up a design wall, asked about a couple of quilt designs, texted me from the quilt store about selecting fabric, and went to work. Her can do attitude and prompt action towards her goals is quite amazing. Back to the design wall. 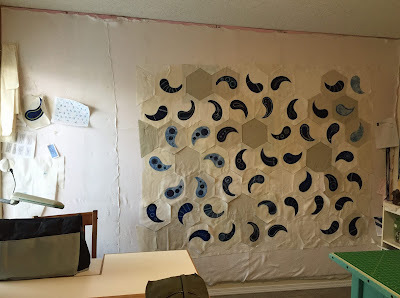 If you've been reading my blogs, you know that I mention design walls a lot and can't even imagine trying to make a quilt without stepping back to look at the progress. Yes, you can use your bed to lay out your quilt, but then you have to somehow mark and remove all the pieces before you go to bed. Just try to sew them together without making a mistake! And then ask me how I know. You can also lay them out on the floor. Then step on them? Or let the cat roll around on them? Nah, not so good either. So, if you haven't already, please, please, please give yourself permission to put up a design wall. Mine covers an entire wall in my studio. Its 12' x 8'. 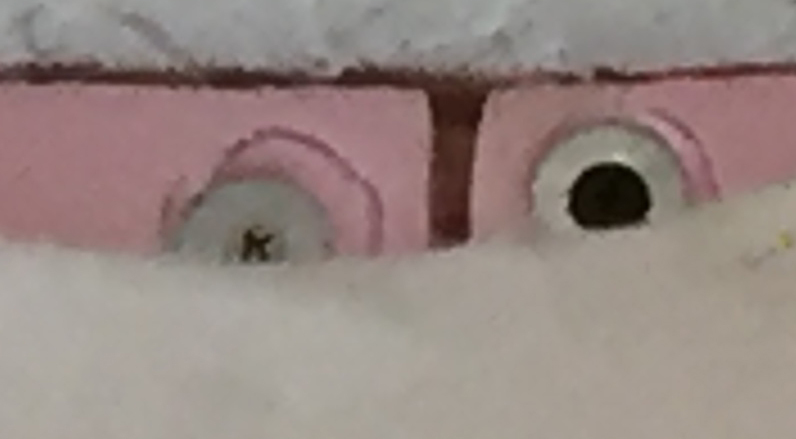 I used 2' x 8' pieces of pink foam insulation. These were screwed into the wall with washers to keep the screws from sinking through the foam. There are 6 screws on each panel; Two at the top, two in the middle, and two at the bottom. These panels are removable, but they do leave a large screw hole in the wall that must be puttied and painted. (I've moved them from house to house and honestly, the walls looks totally fine for the next owner.) Then the pink insulation got covered with a layer of white batting. The final and top layer is lightweight cotton fleece. That layer was just pinned in place around the edges. 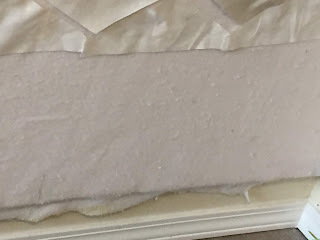 It's not that pretty at the edges, so if you want, you can cover the edges with some type of molding, or you take more time than me and make the edges a little straighter. 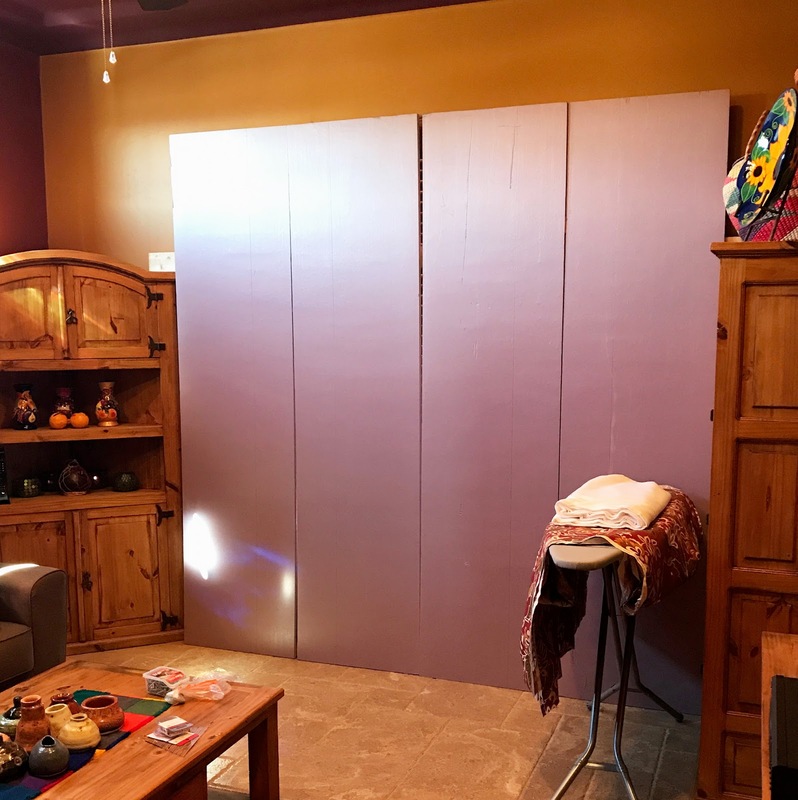 My sister didn't want to put holes into her wall, so she designed a support of lumber on the back and attached her panels into the lumber. She can remove the panels from the lumber, and store it all underneath a bed. She then covered her foam with batting and cotton fleece. 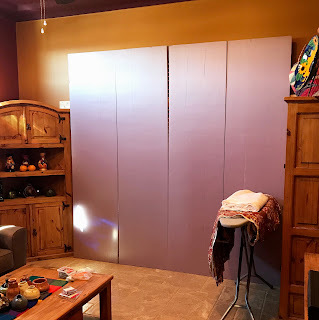 Here is a picture of her design wall before she added her fleece cover. Can you see the lumber sticking out on the left side? I hope you have a design wall, whether it is portable or not. And if you don't, I hope you have found inspiration to get one in place in your studio too! How special that your sister is interested in quilting AND has a design wall. She is going to be stitching lots!!! !